Top : Propulsion : Engines : Diesel : Metcalf Marine Exhaust, Inc.
All diesel exhaust service: from drawings or sample. Black hard-coat lagging and removable exhaust blankets built to fit. Many dump elbows, turbo bonnets, sweep covers, hose and clamps in stock. 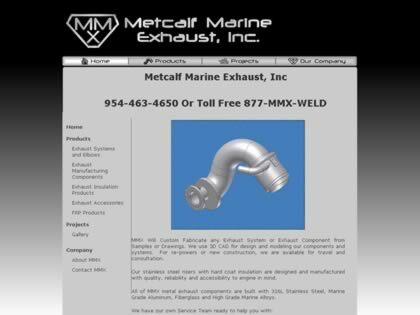 Web Site Snapshot: If available, above is a snapshot of the Metcalf Marine Exhaust, Inc. web site at http://www.mmxhaust.com as it appeared when this site was added to the directory or last verified. Please Note that Boat Design Net has no involvement with the above web site; all content and images depicted in the above thumbnail are the property and copyright of Metcalf Marine Exhaust, Inc. unless otherwise noted on that site. Description: All diesel exhaust service: from drawings or sample. Black hard-coat lagging and removable exhaust blankets built to fit. Many dump elbows, turbo bonnets, sweep covers, hose and clamps in stock. Visit Metcalf Marine Exhaust, Inc.